Look closely at this photograph. Check out the color, the rich lighting and resolution, those freaking awesome goggles. How old do you think it is? What’s even more remarkable is that this entire archive was the vision of a government official. Roy Emerson Stryker fought in the Great War and later earned a degree in Economics from Columbia. When he lectured, he would illustrate his talks with his own photography. Eventually, his Columbia colleague Rex Tugwell left to head the Resettlement Administration, which evolved into the Farm Security Administration. Roy followed him there, eventually setting up one of the greatest photographic documentary projects in history. 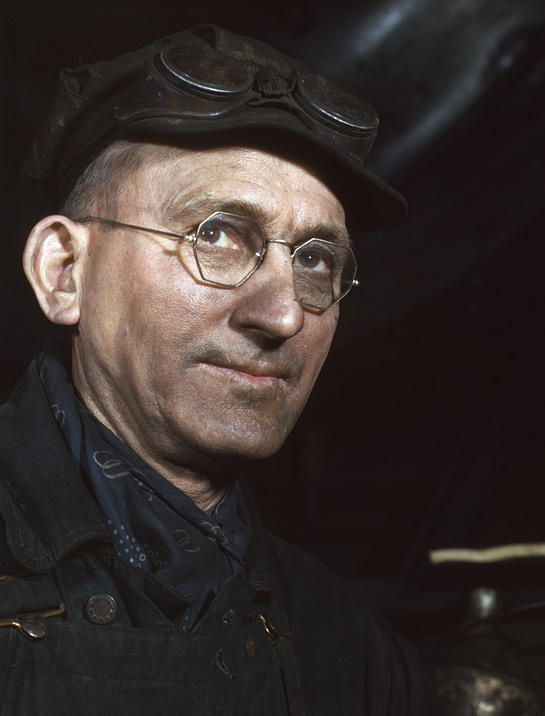 To effectively communicate the hardships the Depression wreaked upon the American heartland and some of the promise of the New Deal, he sent dozens of photographers out on very specific assignments to bring back images which they would feed the press. By the end of his project, the American public owned 77,000 published prints and 644 color images. This economist, this manager, this amateur photographer proved to be one of our nation’s finest curators of artistic documentation. He could just as easily have chosen to be another anonymous bureaucrat, punching the clock and biding his time until his 6pm highball or his twenty-five year gold watch, but not Roy. His mind didn’t settle for the mundane but imagined something far more vivid. And because he bothered to think of it, we have a remarkable trove of images that pack an eye-opening empathy. Do yourself a favor and spend an hour or two with his work by clicking here. After all, you own these images too.